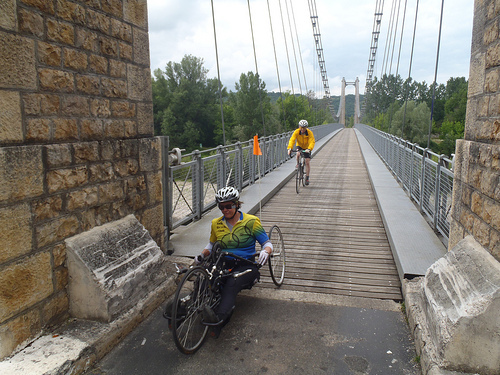 Crossing the Dordogne River - this bridge is shared with cars (one way at a time)! are those white gloves??? !!!!! But they sort of are – they’ve got grey leather palms and fingers and a white mesh fabric on the backs. I wear long fingered gloves even in summer because I shift with my fingertips, and without gloves I smash up my fingernails.